The 2015 Paris Agreement of the United Nations Framework Convention on Climate Change (UNFCCC) has the stated aim “to hold the increase in global average temperature to well below 2°C and to pursue efforts to limit the increase to 1.5°C”. As part of the Paris Agreement, the Intergovernmental Panel on Climate Change (IPCC) was invited to prepare a special report on the impacts of global warming of 1.5°C above pre-industrial levels and related global greenhouse gas emissions pathways. The IPCC Special Report on 1.5°C warming was published on the 8th October 2018 and has received media attention the world over. It illustrates that exceeding 1.5°C will bring climate impacts for many parts of society that will be difficult to adapt to. The report also identifies the difficulty of implementing emissions policies to keep warming to low levels. A warmer climate will trigger more natural emissions of carbon dioxide and methane from thawing permafrost and wetlands, on top of the emissions from burning of fossil fuels. These natural emissions have not typically not been considered in previous assessments of the allowable carbon budgets. When we include them in our simulations we find that allowable fossil carbon emissions for limiting warming to 1.5°C are reduced by around 12 %. This is equivalent to just over 3 years of fossil carbon emissions from human activities at 2017 emission rates. 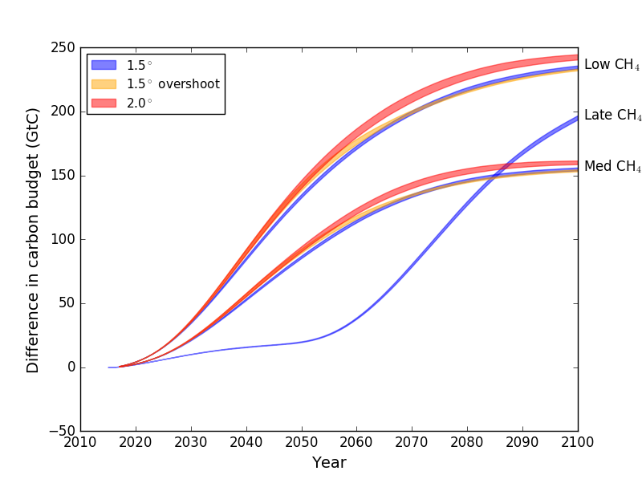 In the 2°C warming scenario, the allowable fossil carbon budgets are larger and the reduction is 8.5 %, equivalent to 4.4 years of current emissions. The red bars represent the absolute fossil carbon emission budget (Gt CO2) for the 2015-2100 period in the absence of the natural feedback process, the blue and green bars represent the budget when permafrost thaw and wetlands, respectively, are included; the grey bars represent the budget when including both permafrost thaw and wetland feedbacks. The coloured bars represent the median values of the climate model ensemble, while the ‘error bars’ show the interquartile spread of the ensemble. Huntingford et al., 2017: Flexible parameter-sparse global temperature time profiles that stabilise at 1.5 and 2.0  °C, Earth System Dynamics, 8, 617-626, https://doi.org/10.5194/esd-8-617-2017. Comyn-Platt et al., 2018: Carbon budgets for 1.5 and 2 °C targets lowered by natural wetland and permafrost feedbacks, Nature Geoscience, 11, 568-573, https://doi.org/10.1038/s41561-018-0174-9. This paper is cited in the IPCC special report on 1.5C warming. Negative emissions, or the removal of CO2 from the atmosphere, are required in the majority of scenarios for 1.5 or 2°C warming. So far, two primary methods have been proposed for large-scale negative emissions: bioenergy production with carbon capture and storage (BECCS), and forests (either growing new forests or maintaining current forests). We investigated the efficiency of these two methods from two scenarios. The map below shows the maximum extent of bioenergy crops in these scenarios over the 21st century. This research found that increasing and protecting current forest area could be more effective than a large-scale commitment to BECCS in meeting the Paris climate agreements. Methane is a more potent greenhouse gas than carbon dioxide, so reducing methane emissions could make a substantial difference in our chances of meeting the Paris agreement. Reducing methane emissions would also have an indirect benefit of lowering concentrations of ozone gasin the atmosphere, which is harmful to plants, resulting in the vegetation being able to take more carbon dioxide out of the atmosphere. This researched concluded that early mitigation of methane emissions would significantly increase our chances of stabilising global warming below 1.5°C, alongside other benefits to human health and biodiversity. 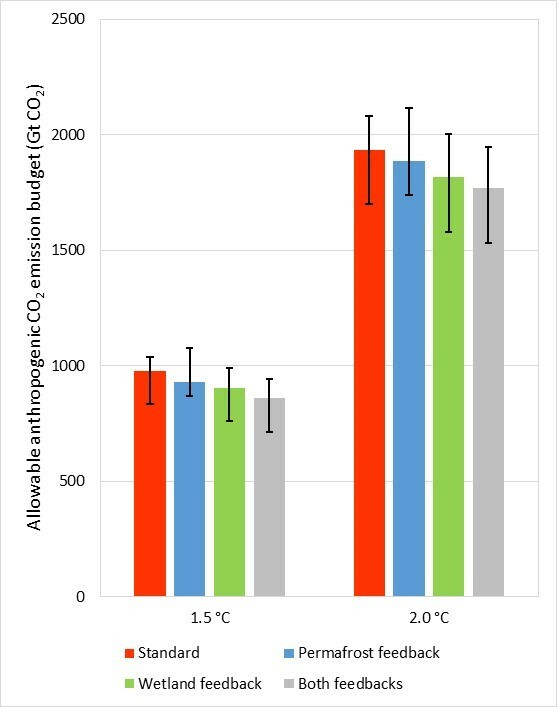 Impact of CH4 mitigation on the carbon budget for three temperature profiles (a) Increase in allowable carbon emissions compared to the High CH4 scenario. Points are plotted for each year 2015-2100. Data are shown for the three temperature profiles. The widths of the lines cover the range of the CMIP5 models; (b) Difference in allowable carbon emissions between pairs of CH4 scenarios, as a function of difference in CH4 concentration for each year 2015-2100. The widths of the lines cover the range of the CMIP5 models. 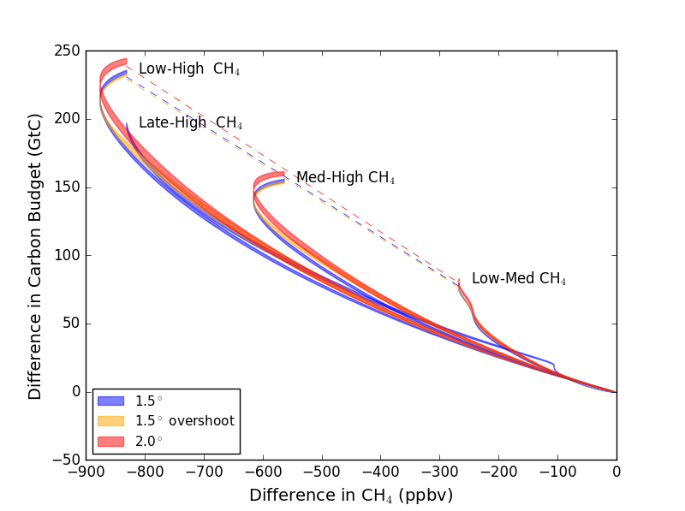 The dashed lines connect the differences in 2100 carbon budget against 2100 CH4 concentrations for the Low, Medium and High CH4 scenarios. For the Late vs High CH4 scenario only the 1.5° temperature profile is shown. Taken from Collins et al., 2018. Collins, W.J. et al., 2018: Increased importance of methane reduction for a 1.5 degree target. Environmental Research Letters, 13, 054003, https://doi.org/10.1088/1748-9326/aab89c. This paper is cited in the IPCC special report on 1.5C warming. The three projects undertook synthesis and impact activities in the form a regional breakdown of the results from all three projects. This provided policy relevant information regarding the preferred option for climate mitigation which was specific to regional environmental conditions and demands. 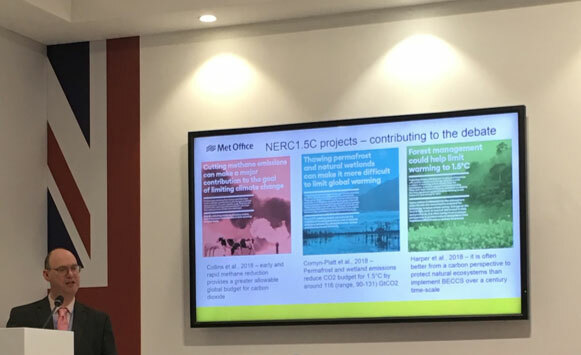 The Centre for Ecology & Hydrology (CEH), the Universities of Exeter and Reading and BEIS organised a workshop in September 2018 to brief UK government policy-makers on the project outputs from this programme. The workshop was timely as it was held during the final government review of the IPCC Special Report on 1.5° Warming. The workshop was attended by 45 participants from the academic research and policy communities. Information on the projects was also presented and distributed at the UNFCCC COP24 meeting that was held in Poland in December 2018. Hayman, G.D. et al., 2018: Regional variation in the effectiveness of methane and land-based climate mitigation options, submitted.